Green Revolution Vol. 40, No. 3 (Fall 1983). What was it that drove Ralph Borsodi at the age of 83 in 1967 to try to launch a worldwide non-profit and non-governmental banking program which would provide credit to small farmers in poor countries? And what motivated him a few years later to launch, almost single-handedly, a local currency in Exeter, NH, an accomplishment that brought reporters fromTime magazine, Forbes and many others to interview him in Exeter? 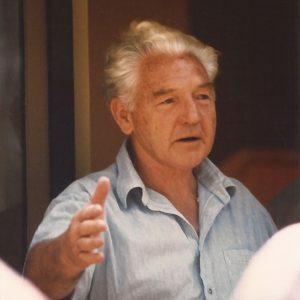 At the end of a long life of promoting, advocating and practicing decentralism, Borsodi said, “Unless the dishonest centralized government monopoly of money can be broken, no significant social reform is possible.” Moreover, he saw and predicted the end of the present world wide monetary system which creates inflation, and impoverishes the poor people of the world. It would not surprise him to read the recent articles in the. Wall Street Journal and every other news magazine (Time lead line “Debt Bomb Threatens World Financial System”). It was perfectly clear to him that the international monetary system was headed for collapse and he guessed that it might be the failure or the inability of the poor countries to repay their debts to the IMF, World Bank, and the banks of the industrialized countries that would trigger massive world wide inflation and finally collapse of the present system. It would only have surprised him that the system has held together as long as it has with only patchwork solutions. It was for all these reasons that he spent the last years of his life and his energy, often at great risk to his health, concentrated on how to make a beginning towards breaking the monopoly of the central government monetary system. All of the schemes which he devised were designed to challenge that system. He had convinced J.P. Narayan, the leader of the Gandhian Sarvodaya movement in India to help him launch the International Independence Foundation, which would have provided investors/depositors with a guarantee against government created inflation, as well as small farmers with low interest loans (high interest rates are today the primary reason for the highest rate of bankruptcy among farmers in the U.S. since the great depression). When that scheme was frustrated as a result of J.P.’s decision to concentrate his energy on working with the relief program in India where the failure of the monsoons had created havoc and starvation in the state of Bihar, Borsodi decided to try to start a small experimental program in India with some of his own money. He left by way of London to initiate this program, but he was forced to give it up when his strength gave out in London and his doctor ordered him to return to the States. He was in California at the time and immediately upon his return to Exeter, N.H., his home, he contacted the president of the local bank, a friend of his, to obtain his cooperation in the proposed experiment. The bank president agreed to cooperate by having the bank act as a “money changer” and to accept deposits for the experiment. As a “money changer”, the bank would simply agree to exchange dollars which Borsodi would provide, for the notes (“Constants,” Borsodi called them) which Borsodi would issue. People wishing to join in the experiment would deposit money in the Exeter Bank in a joint checking account which would, then, be kept in Constants rather than dollars. Since Constants were based on a “basket” of commodities and an index of these commodities which Borsodi had developed, they were in effect, protected from inflation. In addition, Borsodi issued Constant notes as well as silver coins and sold them for dollars at the Constant exchange rate. To everybody’s surprise, even including Borsodi, many people bought Constant notes and made deposits in the bank checking account. At the same time Constants began to circulate around the town of Exeter, where restaurants and other businesses accepted them in payment. If these businesses received more Constants in trade than they could use for their own buying needs, the owners could go to the bank and exchange them for dollars at the then going exchange rate. Since dollars were going down in value relative to Constants as determined by the index, those people holding Constants were reluctant to exchange them since they would lose on the exchange. For this reason, and, therefore, Borsodi did not have to keep many dollars on hand at the bank for exchange purposes. His objective was to invest the dollar deposits in most, if not all, of the commodities in the “basket” (thirty commodities which represented the most important commodities in World trade—agricultural products, energy, and minerals). He began investing in the most storable commodity available, silver (gold was still illegal for U.S. citizens to buy at that time). Silver, with gold and platinum, was and is, one of the metals which has been traditionally associated with “real” money in the past. Borsodi, however, wanted to eventually invest much more heavily in the other commodities in the basket—especially agricultural commodities such as wheat and rice which are universally used and needed throughout the world. But this part of his scheme would be the most difficult, he knew, because he devised a complicated scheme which would have utilized expert “spot market” arbitrages eventually. But that would involve literally millions of dollars (or Constants) worth of grain and other products. The Experiment, then, was obviously limited in scope. Unless some large bank, or large corporation would step in and involve itself in helping to launch a new, independent and genuine world, as well as local currency, the Experiment would remain just that, an experiment. Whether Borsodi, really expected the Experiment to expand to a world level, I do not know. But it did not happen and again his doctor told him he would have to give up the very difficult job he had taken on in the Experiment with only a small handful of inexperienced volunteers to help him. As one of the volunteers helping Borsodi in the Experiment and also involved in the International Foundation attempt, I have continued over the years to search for ways in which this Herculean effort of Borsodi’s could be carried forward. In an objective evaluation of the Exeter Experiment, it seemed to me that several aspects of the experiment had been developed successfully and could be duplicated elsewhere. One of these was the strategy of utilizing small local banks as the administrative agent for starting a new monetary system. As Borsodi often pointed out, local banks are not the problem in themselves. The problem is that they have to deal with dollars only and the issuing of dollars is a monopoly of the centralized government controlled system. Local banks provide an important and needed service in accepting deposits, making loans, keeping accounts, and collecting payments on loans. The second lesson which I think the Exeter Experiment demonstrated, was the interest which people had in using a new kind of currency which was not subject to government created inflation. (As one Exeter citizen put it, “Whose money is funny anyway, his money or the government’s?”) Local businesses also accepted the money in payment, partly because they knew that customers might go elsewhere if they didn’t, partly because some of them, at least, realized that the creation of a local currency would be in their interest, and in any case, they knew that they could go to the bank and exchange Constants for dollars if necessary. Certainly, at this level, the bank involvement helped tremendously to give confidence to the whole project, and the merchants in particular. Further, people seemed to realize that here was money, unlike government money, which was backed by something real—the commodities themselves, ail of which were listed on the notes, and they could also see on a week by week, or month by month basis, as the index (or the exchange rate between dollars and Constants) was published, that Constants were gaining in value against dollars. This also increased confidence. Two years after moving from Boston to Great Barrington, in discussion with a group of like-minded people, we decided that we might make a beginning in the process of issuing a local currency by first capitalizing on Borsodi’s demonstration of the value of involving a local bank. But we felt it would be a mistake to initiate this process with a local currency itself. For one thing, we had not proven ourselves to local bankers, they would not necessarily have confidence in us. We would have to create that confidence, and that would mean creating an organization. Moreover, going back to the original International Foundation concept of Borsodi’s, we realized that creating a local currency, in and of itself, was not of tremendous value, unless it could be tied to the purpose of creating greater local or regional self-reliance, and thus be used for decentralizing the present system. After all, this was the major purpose behind the original Foundation, and, in one sense, the creation, or issuing of a non-inflationary currency was important primarily because it would attract investment of dollars into a decentralized framework of development. The fact that out of this scheme would come a local currency was, from the point of view of local development, almost secondary. In other words, if as is presently true all over the world, local deposits in dollars were not sucked out of the local area into the huge metropolitan areas and into the big corporations which can afford to pay the highest interest rates, then even dollars could be made to serve a more useful purpose. Out of this thinking grew the SHARE program which stands for Self-Help Association for a Regional Economy. Like the Exeter Experiment, the SHARE program utilizes the administrative services of a local bank. Like the Experiment, depositors put their money in a joint account at the bank. Unlike the Experiment, but like the International Foundation, the primary purpose of this money (dollars) is to collateralize small loans to local producers (farmers, small businesses, cottage industries, etc.) What is most unique about the SHARE program is the criteria which are used by the SHARE loan committee for making a loan. The primary criteria, aside from sound financial considerations is that the loan will increase local self-reliance, but in addition the criteria include ecological considerations as well as encouraging distribution of profits to workers and to the community as a whole. What are the advantages of the SHARE program? Although the bank makes the loan and collects payments, the decision on the loan is made by the SHARE board elected by the members. Low interest to borrowers—about two-thirds the going bank rate. This is possible because the SHARE depositors take the risk and the bank only receives a fee for its administrative services. Depositors receive the same rate as the usual 90 day notice savings deposit account (about 6%). Depositors are assured their money is being used only to to improve or encourage the local economy, and this helps them eventually also. A system of peer Associations (Agriculture, Small Business, etc.) is established which first approve the loans and secondly monitor them and provide technical assistance if necessary. This system provides the best guarantee against bad loans. But we recognize that the SHARE program, which is very much like a Credit Union, is only the first step towards creating a local currency and thereby an independent local economy. It’s major advantage, from this perspective, is that it is building a base, a constituency of depositors in the community and confidence in community—as well as developing a strong working relationship with the local banks, merchants and farmers in the area.